Business incubation was a concept that started in the United States in 1959 when the Batavia Industrial Centre was opened. Incubation expanded in the US and spread to the UK, then Europe. The following graphic shows a “potted history” of business incubation. this be micro-financing, business planning services, or book-keeping services. with alternative ideas to help them achieve economic sustainability. Hello! The alternative is a continuation of the social welfare paradigm. 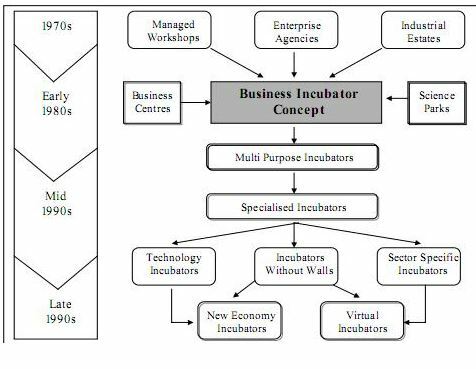 So what is the Business Incubation concept, in its totality? such as tax and the law. provided and to what end. small business funding initiatives should be explored. partner with the local university or regional TAFE? but rather an office space to allow people to work ON the business. track and not a performance measure on continued attendance. stages of support that can be offered. Firstly: A true and sustainable business incubator is exactly as you describe it to be. Secondly: Your final words regarding how people and some organisations use the term but in fact are motivated by fast cash by a referral, or simply to tick some short political box by pointing out a grant opportunity, is so close to the actuality for some, very little value because the vision is not to create a strong sustainable business but to report numbers of “visits” or new ABN’s !! Thanks Shane. I get very angry at so-called consultants pretending they are helping Indigenous organisations when in fact their attitude is not “service” but instead “profit”. I am a consultant, but I value providing a full and complete service for the long term benefit of the client. I make a profit, but I believe I do so because I value the client, not the dollar. I’m always happy to help Trevor. Please feel free to email me at teik@otsmanagement.com.au and let me know how I can help.